My favorite U2 song that begins with F is Fly, The – uh I mean The Fly. I had to cheat a little with my favorite U2 F song because there aren’t any U2 songs that begin with F that are my favorites. I love The Fly because of its lyrics, but I didn’t truly appreciate it until the 360 tour last summer- even though I had seen it during its heyday on ZooTv and again on Elevation. 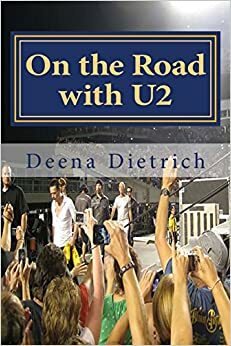 I got really excited when U2 played it at the second show in Anaheim and then continued playing it through the rest of the tour. My favorite part was when Bono would shout, “Achtung Y’all!” just as he used to on the ZooTv tour. It’s no secret that our world is in darkness tonight. Y’ know I don’t see you when she walks in the room. So I’m telling you, child. It’s no secret that a conscience can sometimes be a pest. It’s no secret ambition bites the nails of success. It’s no secret at all. The universe exploding ‘cos-a one man’s lie. There’s a lot of things if I could I’d rearrange. What is your favorite U2 song that begins with F? I’ve always loved this song by U2. I heard it for the first time when I studied abroad in Ireland so it brings back great memories. I can see that you’re enjoying the challenge! I really am enjoying the A to Z challenge. Thanks! Yes! Love this one. And it was great on 360. Yeah 360 made me fall in love with The Fly! Thanks for reading! Yes The Fly, one of the best U2’s art of work!!!! !Amazing song!!!! !